Katriel was born and raised in Honolulu, where he graduated from McKinley HS in 2011. He is currently a junior at UH M?noa, pursuing a BS degree in Computer Engineering. He also plans to minor in Computer Science. 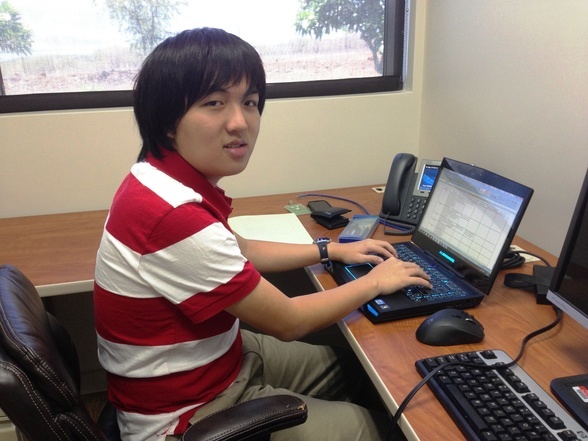 Katriel works on campus as a math tutor, and he is a student member of IEEE. His career goal is to be a software engineer. In his free time, Katriel enjoys playing video games on his computer, playing piano and clarinet, bowling, and attending church and church fellowship. 2c4 Technologies and Hawaii Resource Group are companies that work alongside the Pacific JITC (Joint Information Technology Center) and ITEC (Integrated Test & Evaluation Center) in providing services for the Department of Defense. Some of these services include creating and customizing virtual environments to the needs of the customer. As such, the company has to purchase hardware systems in order to provide a storage center and networks for their clients. Each person in the company manages and monitors various aspects of their systems and only collects the data related to their position. Therefore, the creation and development of database storage will allow everyone within the ITEC to consolidate all their information into one place and display it for others. Since this project will eventually benefit the company in the future, each individual inputted their perspective on specific statistical reports that should be included in this storage center. Several people already have an application that monitors these metrics for them. After spending time researching the features and architecture of the applications, we narrowed down our options of a database design. Of our designs, we have considered creating data connectors, which will directly link our database to the information in an application and pull it from there. We felt that this was the easiest route as many of these applications exposed APIs (Application Programming Interface), which provided built-in functions that directly accessed the information we wanted and as a result, made it easier for us to code.